Welcome to the Carlow Association London, online. The Association represents and welcomes Carlovians living in London, and throughout the southeast, to its functions during the year. The organisation is non-political and non-sectarian. In fact, anyone can join us! You’ll always be welcome at our events – you don’t even have to come from Carlow – but a strong connection always helps. 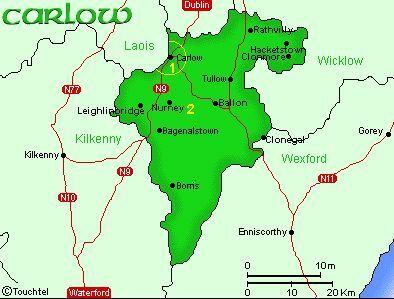 County Carlow is a beautiful county of rolling hills set centrally within the province of Leinster in the sunny southeast of Ireland. The county is landlocked and bounded by the five counties of Wexford, Laois, Kilkenny, Kildare and Wicklow. Carlow is easy to get to with direct train links from Dublin and Waterford. It is easily located for travellers by Ferry arriving at Rosslare or Dublin.